At about 9:00am, I went out and immediately noted a 22-degree halo with a bright Upper Tangent Arc. Both parhelia were also present, appearing small and slightly elongated. The parhelia were detached from the 22-degree halo and appeared to migrate outward over the next hour. Over the next few minutes, the Upper Tangent Arc brightened tremendously, and a complete circumscribed halo was visible including the Lower Tangent Arc. At the same time, a complete Parhelic Circle appeared, passing above the Last Quarter Moon to the right of the Sun. 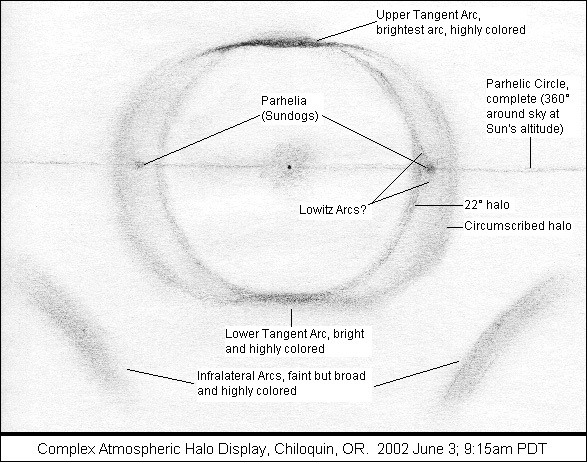 The Parhelic Circle was colorless, with no 120-degree parhelia or antihelic features noted. 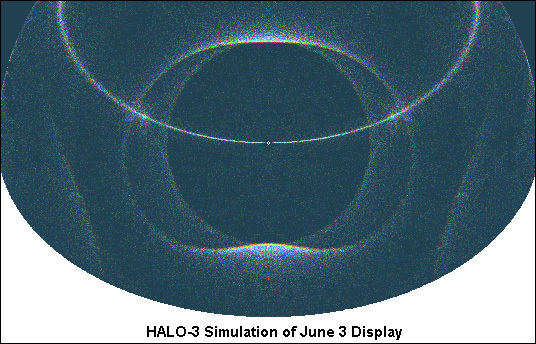 At the height of the display, possible Lowitz Arcs joined the right parhelion to the 22-degree halo. These were fleeting features. Both right and left Infralateral Arcs were visible, looking like faint rainbows arcing above the trees near the horizon. The display had faded greatly by 9:45, but most of the features were visible for a couple of hours. Around noon, there was a faint, colored suncave arc directly under the sun at 46 degrees distance. This was most likely formed by the Infralateral Arcs. The HALO 3 simulation below uses hexagonal crystals in the following orientations: "random", horizontal column, plate and Lowitz.